We know this, and we forget this. We descended (with modification) from organisms over billions of years. 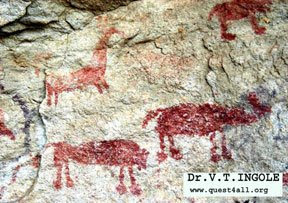 We didn't start drawing on cave walls until about 30,000 years ago. After we started, a few of us thought maybe we'd be better off if we didn't. Last week Mark came to visit--he's a film editor, and a good one. His professional life revolves around his vision. He speaks in paragraphs, about a third of which involve discussing ways to manipulate light. He makes a living creating graven images. I introduced him to clamming. When you rake for clams, you feel the bottom of the bay through your handle. When your rake hits a clam, you as much hear it as feel it. You reach into the soft mud, then wrap your hands around the clam. 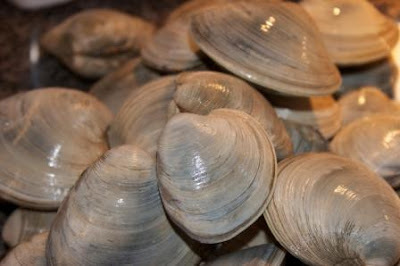 A quahog fits perfectly in your palm. You know you have one before you ever see it. No words, no pictures, no imagination can capture the satisfaction of feeling the firm curve of a quahog in your palm, fulfilling a desire you did not know you had. When you stare at the monitor, you are catching photons with your retina. Your monitor mixes together red, green, and blue--your eyes and your brain do the rest. And it is, mostly, just sophistry. A decent magnifying glass will show the three colors, you might be amused for a moment, and then you go on. Bear with me, this will meander back to teaching science. I grew up Irish Catholic, and wandered into other sects once I started reading the Bible. My world view, for better or worse, is framed by Christendom. Whether Christendom has much to do with the Christ is another story for another time. Old collections of words that have survived generations upon generations of readers may not reflect truth, but we can learn from ancient worldviews. Not all of us who own Bibles wield them as weapons, though I do confess they work well on centipedes. On the wall in Sunday school class was a poster of Garfield the Cat. It was an ordinary poster, nothing special, just paper and ink. Garfield has his usual snarky expression, and every time I looked at it, I had my usual visceral response. I do not like Garfield. The Ten Commandments came up in Sunday school, as they will. Most of the commandments are easy enough to understand. Don't kill. Don't steal. Don't lie. Do not lust over your buddy's wife. While you're at it, stop fantasizing about his Maserati. Basic stuff. The ancients knew the power of vision. What you see becomes part of you. Yes, I can step back and see that Garfield is just paper and ink, but this requires work. When you look at a photograph, you are in the world of the photograph. Until 30,000 years ago, if I saw a big cat, it was a real cat, one that posed danger. I reacted. If I did not react, my DNA ended up in the tiger's gut, not a good place to procreate. For billions of years, the particular strands of DNA that make up me managed to replicate. Eyes have been around for over 500 million years, and offer an obvious advantage to survival. For organisms with vision, seeing is believing. For humans, it is how we learn about the outside world. I mentioned Garfield the Cat during a discussion about the Second Commandment, and why I thought that this particular commandment revealed a subtle wisdom by our ancestors. I don't think I'll bring up Garfield again should I venture back. And what does this have to do with teaching? Our children are surrounded by human-generated images. Art. Advertisements. Branding. They make things real by taking pictures. A child constructs a model rocket, then captures it with a camera. The image is more valuable than the rocket, which has since been discarded. In science class we throw image after image at our students, without discernment. We throw picture after picture after picture. Here's a rain forest in Ecuador, there's a polar bear, look, a bacterium--each fills the Smartboard screen in vivid colors, one after another, without reference, without discernment. A photograph of a frog teaches little if the student has never held a frog. Once we learned to manipulate images, sight became magical. Our children believe in magic, but so do the adults. We have created our own worlds. If you live life in an artificial world, in front of monitors and televisions and photographs and books, you can have beauty and dazzle and immortality. You can have joy and tears. You can free yourself from boredom. You might even find love. You will, however, be limited by the imagination of humans. You will also be "freed" from the reality of natural limits, and for many of us this is worth losing. When I stand in my garden in April, I cannot truly imagine it filling with tomatoes and basil and dill and squash by late July. Still, by November, most of the plants are dead, no matter how many pictures I take. As a teacher, I want the children to grasp the limits of their imagination--only then can they start to grasp this thing around us, what "awesome" truly means. The Garfield image generated more hits than my words ever did. I've been thinking a lot lately about the image addiction, about the notion of knowing the image better than the person. It's been on my mind since reading Fahrenheit 451 with my students, but I hadn't connected it to the Bible or science for that matter. That's what I enjoy about your meandering prose. Everything connects. I'd be interested on your thoughts on the 2nd Commandment--most folks mumble something polite and amble on once I poke my head into the book. There's a lot of collective wisdom there, but that wasn't supposed to be the focus of this post. I'll go ahead and take a stab at it. I think the warning is about the danger of imagery and abstraction. I could be wrong, but it's sort-of a pandora's box idea. The Bible was written in an oral tradition and I wonder if part of the warning is how we tend to misrepresent God, nature and humanity as we go from oral to image (and perhaps from image to digital). If nothing else, it's certainly a warning about the inherent power in imagery. As an aside, I have a pretty strange view of the commands in the first place. I see the Bible as a long, disjointed, almost postmmodern love story. So, I tend to view the ten commandments with the question, "How would these help people to love one another better?" On a social level, I wonder if the wisdom in the second command might be in warning those with a theistic worldview against two types of idolatry that occur in image-based cultures. The first being absolute pantheism (or perhaps animism), where all things material are god and the other being a sort-of naturalist/ logical mindset (ranging from atheism to Deism) where there is nothing spiritual to the clockwork universe. So maybe, God created it so that we would remember that he exists in paradox and mystery and that he's relational, but not tied down to any object. So, maybe it's God's way of saying, "I want to be loved and known" like anyone else in the universe. On a personal level, my thought on the second command is that, when we are careful about images, we are able to see the beauty of life and the beauty of people. We won't get hung up on abstract ideology and view people as secondary, nor will we objectify people as mere "things."